Could DHS Steal 2016 Election? Browse: Home / Could DHS Steal 2016 Election? Using “Russian hackers” as a pretext, Democratic Party go’fer Jeh Johnson wants to “take control” of the election process. Is this a last minute attempt to stave off a Donald Trump victory? 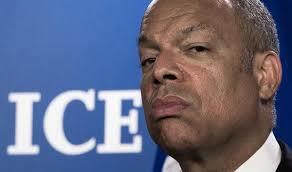 Jeh Johnson, head of Dept Homeland Security. Globalists at DHS are thinking of monitoring the election. What this means is that one-worlders would be counting the “votes.” DHS wants to declare the election a “critical infrastructure,” giving it the same control over security it has over Wall Street and the electric power grid. “We should carefully consider whether our election system, our election process, is critical infrastructure like the financial sector, like the power grid,” Homeland Security Secretary Jeh Johnson said at a media conference hosted by the Christian Science Monitor last month. To take the vote away from the people, Johnson wants to centralize the election system and do away with the conventional system where states run the elections. “There’s no one federal election system. There are some 9,000 jurisdictions involved in the election process,” Johnson said.